The Sidi Fusion Boots are a good bargain in an entry-level sport boot for all-round street wear and occasional track days.The Fusion boots also forgo the removable and replaceable parts featured on the high-end Vortice and B2 boots, although the plastic toe sliders on the Fusion boots are easily replaceable. For a motorcycle boot the minimum requirements are toe, ankle and heel protection the Fusion boots offer that and more. The Fusion boots have a full range of features including very sturdy toe and heel cups, a sewn-in panel on the back that is designed to protect the Achilles tendon and another stiff panel in the front to protect the shins. also have both an inside and outside ankle protector. The Fusion boots are not claimed to be water resistant, but with no openings other than the small vertical expansion panel, the boots are fairly waterproof in light rain or an occasional splash while still not overly sweating your feet. 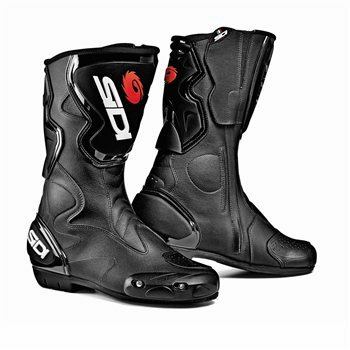 The Sidi Fusion boots are an excellent choice for street and sport riding. They have a full array of safety features, other than the torsional ankle bracing system found on boots costing about twice as much. Technomicro Microfibre Outer Skin When constructing most of the Sidi boots, Sidi uses a new generation material called ‘’Technomicro’’. Technomicro is a composite microfiber material created from strands that are so fine, each one is less than one thousand the thickness of silk. These fibres act like natural leather skin, but with the advantage of better strength, softer texture and lighter weight. Technomicro is also water resistant, highly resistant to abrasion and tearing and is easy to clean and maintain. Technomicro doesn’t stain and offers reduced weight, more flexibility and a better feel than leather or other synthetic material boots. Air Teflon Mesh Inner Lining This fabric has been treated with TEFLON Fabric protector, DuPont’s high performance protection against water and stains. Teflon acts as an invisible protection to provide maximum water and stain repellency, to keep your garment drier and more comfortable in all weathers. Teflon surrounds each fiber, maintaining the breathability of the fabric. Teflon is durable to washing and dry cleaning. Zipper Elastic panel Sidi has added a small elastic panel to aid in a smooth zipper operation as it allows a bit of movement via the elastic as the zipper passes over the riders ankle ball. Rubber sole with removable insert The sole is constructed of a polyurethane and rubber blend. It features a removable insert in front of the arch are where much wear and tear normally occurs due to sharp metal brake pedals and shift levers.